So you’ve come here to find the best dual shower head for your bathroom, if so… you’ve come to the right place. Often times one can ask, “since when did one shower head not be enough?”, and the simple answer is this: it’s been that way from the very start. With a DUAL shower head, designed for 2 person capacity, you’ll experience a great time showering with your significant other, your kids, or maybe just by yourself taking in the extra flow of water. Whatever your reason is, a PROPER multi head shower system will do the trick IF you can find the right type of double outlet shower head. 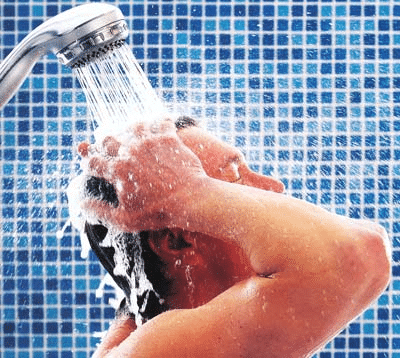 In this detailed buyer’s guide, we are going to dive deep into 7 individual dual shower head reviews, finding out the important stuff, and the primary reasons why you’ll love owning each one. Just be mindful that not everything is priced favorably, in fact some thing are outright expensive… but with price comes build-quality which usually can’t be mistaken. So right above, you saw the top 7 dual shower heads. Each one is designed to be two-in-one with two shower heads coming from a single water source. 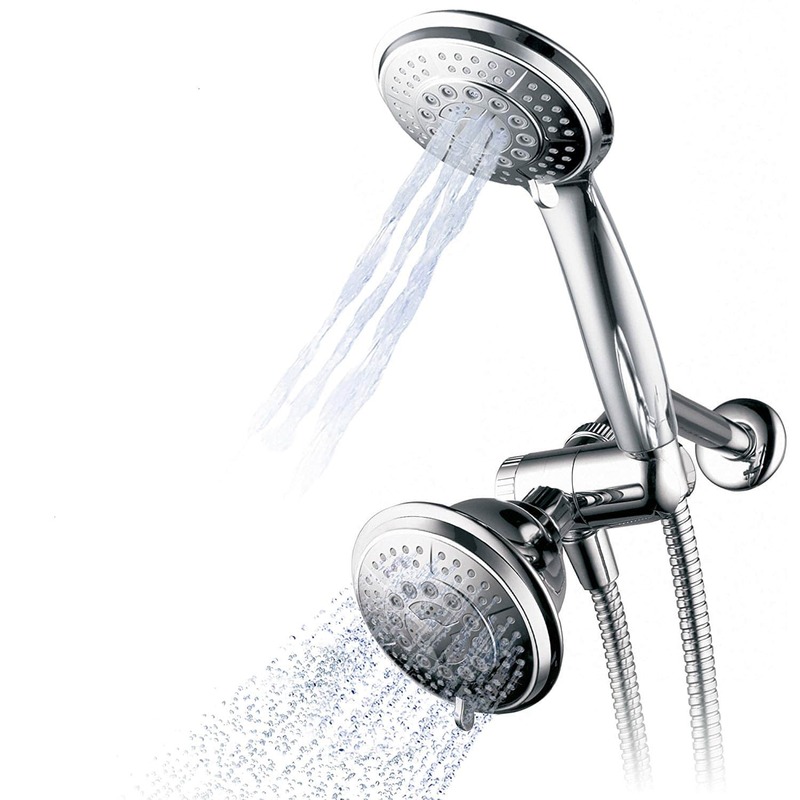 They can be used for men, for women, for couples (a romantic his and hers dual shower head), and even for kids. 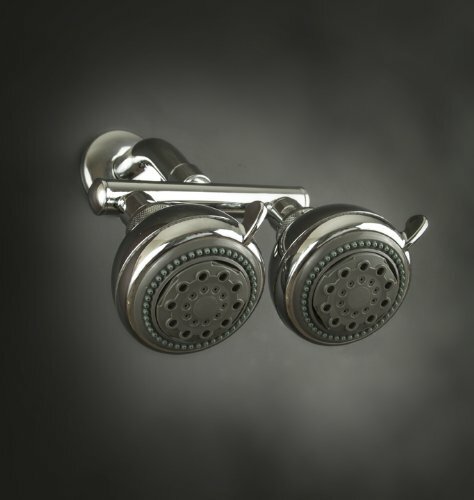 Reading further into this guide, let’s talk about detailed dual shower head reviews and how these 7 options stack-up to each other. The Hydroluxe Full-Chrome 24 Function Dual Shower Head made it to our list as the best dual shower head you can buy for the money. First of all, what caught our eye was more than 7K reviews on Amazon. The two headed monster has a lot to offer for the price, and I’m here to explain what make it pop!To get things started, it must be said that it has approximately 24 different functions (Power Rain, Massage, Stay-Warm Mist, Water-Saving Economy Rain and Pause). There’s many different water flow patterns to choose from, and connected directly to the main shower head… is the OTHER shower head which gives you the twin-stream of water with an equal amount of settings to choose from.The configuration for each shower head, is exactly the same. However you do have some flexibility. You can use them as both fixed heads, OR one fixed and other handheld. It’s a 2-in-1 kit that packs GREAT value from the box. We highly recommend you strongly consider this one. It has 24 different functions for different spray patterns, very impressive! Easy installation for the entire kit, takes just minutes with few tools. Incredible price for the entire set, good value for the money. 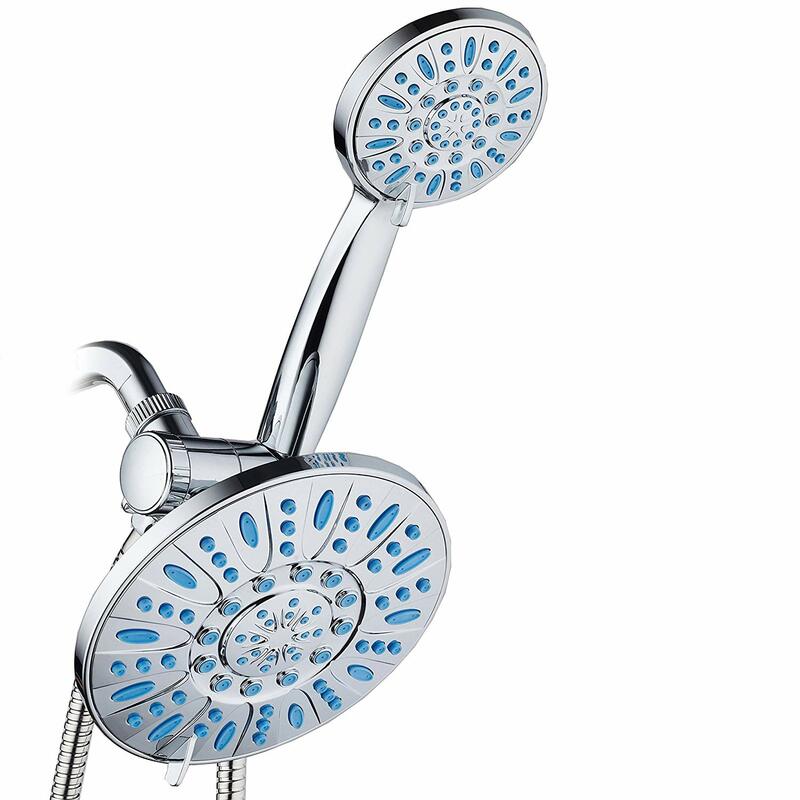 The AquaDance 5528 Dual Shower Head is a worth contender for our #2 spot. If a simple installation is what you’re looking for, look no further. It’s a GREAT dual head shower, as well as a portable in-hand shower shower which lets you take full control of your cleaning endevour. Now we can’t skip over that it has 30 different water-flow patterns… talk about overwhelming, right? A big bonus with each water nozzle is their protection against calcium build-up that you frequently can see from other shower heads with “unprotected” nozzles. Lets not even forget the germs which can accumulate at the tip of each nozzle. Luckily, there’s a Antimicrobial coating on each (labeled by AquaDance as AMT) which inhibits growth of mold, mildew and bacteria. Now lets take a step back and see how much coverage we’re actually getting. With both, you get a combined circumference of 11″ inches, 7″ inches from the main one, and 4″ from the detachable one, not bad. The whole kit is adjustable in almost any direction you can think of, so flexibility is no issue. Lastyl, there’s a impressively long 60″ inch/5′ foot stainless-steel hose which has the weight which makes it convenient for YOU to stay comfortable. We love that it has 30 different water patterns to choose from, literally a combination that everyone would be happy with! Each water nozzle is built-in with an antimicrobial coating, this is great to avoid possibly harmful things building up in the future. Can’t go wrong with two shower heads, especially with their width. 7″ inches and 4″ inches is not bad! 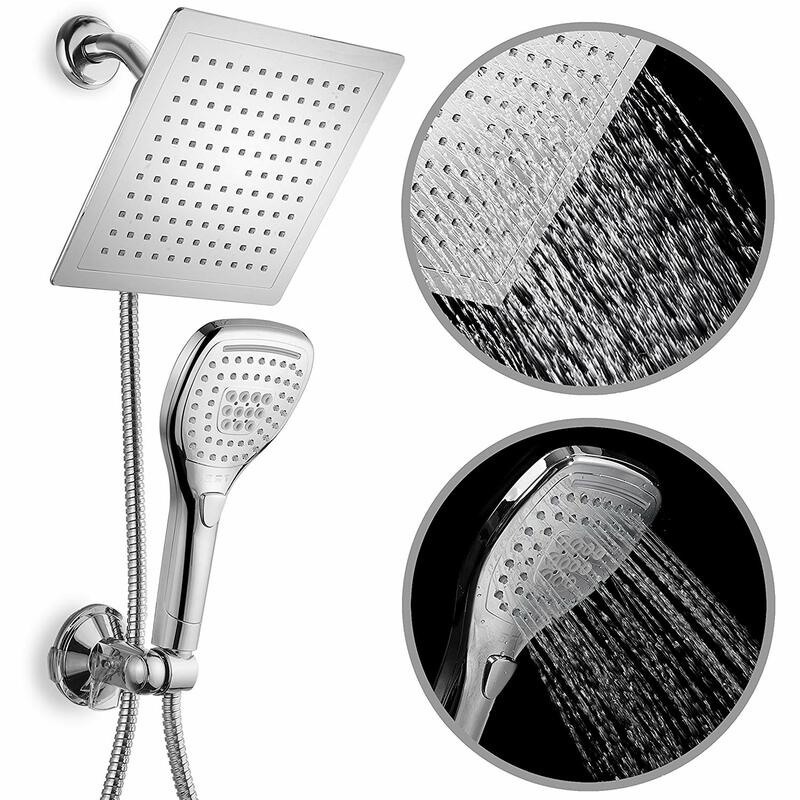 Coming in at number 3 on our list, its the DreamSpa Ultra-Lucury 9″ Dual Shower Head. The first impression we had was… jeez that’s a big square shower head, and it actually is quite impressive at 9″ inches wide… enough for a shower for two without much hassle. Now that’s not where it stops, in fact there’s an additional detachable unit which does the same thing but with a push of a button. That button lets you control the water flow coming from either the main 9″ inch head or the 4.75″ inch head.The main unit can be mounted overhead so it can rain down on you like a warm summer thunderstorm. From start to finish, there’s truly no complicating tools required… an adjustable wrench at most and if you have handy, some teflon tape. The one thing you must get right from the first time is where to mount the handheld portion. There’s double sided tape which can hold it in your bathroom, but once peeled… stickiness is drastically reduced. Just so you know.Lets cover some thing we absolutely LOVE about it which are the main highlights from this rather short review. The main unit is a wide shower head in all corners, when mounted up-top can result in a soothing rainfall feel which goes hand-in-hand with the detachable portion. Push button control for switching water flow between the two makes it very convenient for choosing which end you want to shower from. A price you will love, at around 40 dollars according to Amazon. Truly a bargain! Now when it comes to a true DUAL experience, this KES Double Shower Head is truly the way to go. You see, unlike the ones mentioned above… this one actually has a splitter which acts as a diverter for water flow. The only downside here would be the water pressure which would a bit less considering it has to go through TWO outlets at the same time. Considering there’s a water flow restrictor included inside (illegal for companies not to include them), you can have it there as a temporary thing which can later be easily removed.The entire thing is made of durable brass and coated in chrome (however can also be picked in a brushed nickel coating). It has a very simple design, and a simple purpose. You easily mount it to your existing shower outlet and lastly you adjust the shower heads towards the direction of your choice. Each head actually has 5 different settings which give you a certain level of personalization.On all 3 sides, its the standard 1/2-inch IPS connections which are compatible with most modern showers. There are 3 options for this model, you can either get just the Manifold itself, the Manifold with the 2 Shower Heads, or the Manifold with Outlet Vales built into them. Overall, its a SOLID package! True dual nature of this entire unit, you can have two of the exact same shower heads output the same amount of water… and move them into almost any direction. A double-sided unit in the purest definition. Gotta love the price, for $25-$35 dollars, you can’t go wrong with this buy, especially if you’d like to have it last a while! Brass material and two options of colors are a good variation for different tastes a consumer might have. We’re moving into more expensive territory… but its for good reason. You see, when we did the initial digging around, the Zoe Industries Neptune came up multiple times. To our astonishment, its a good one! This thing is a complete package, you get the manifold which is made of durable brass, and two 3-position adjustable shower heads. 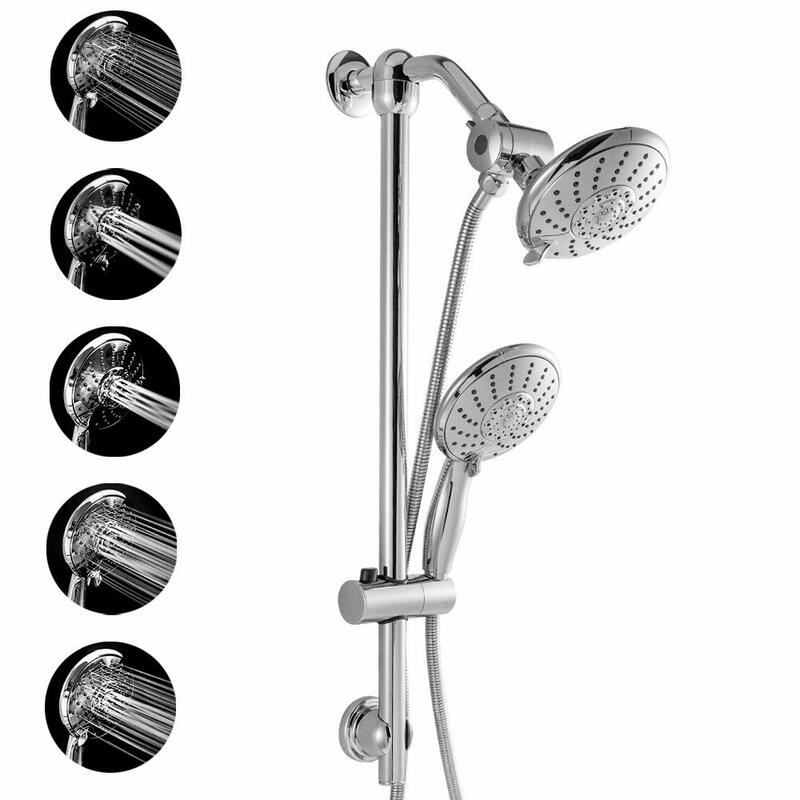 Each one swivels independently on ball-joints, and this could be used as either a shower for 2 or a independent twin stream shower which a solo individual can enjoy. As you have already noticed, the manifold acts as a shower head splitter… so you may experience a reduction in water pressure from having both heads running at the same time. However, if you remove the flow restrictor and manage to get the water pressure up in your water supply, you’ll have absolutely no problem (assuming of course this is a problem in the first place). While this may be a pricier unit compared to all other dual shower head reviews we’ve done… its because you get a complete package, a combo kit, a total set. Being a total kit makes it convenient for everyone to use, no additional parts required to buy. We love the durable build and position selectable shower heads, its double the fun! You are likely to experience a good re-sale value from this compared to much cheaper made units. Brass, nickel coating, a unique design… its a desirable package no-doubt! We’re moving into more expensive territory… but its for good reason. You see, when we did the initial digging around, the Zoe Industries Neptune came up multiple times. To our astonishment, its a good one! This thing is a complete package, you get the manifold which is made of durable brass, and two 3-position adjustable shower heads. 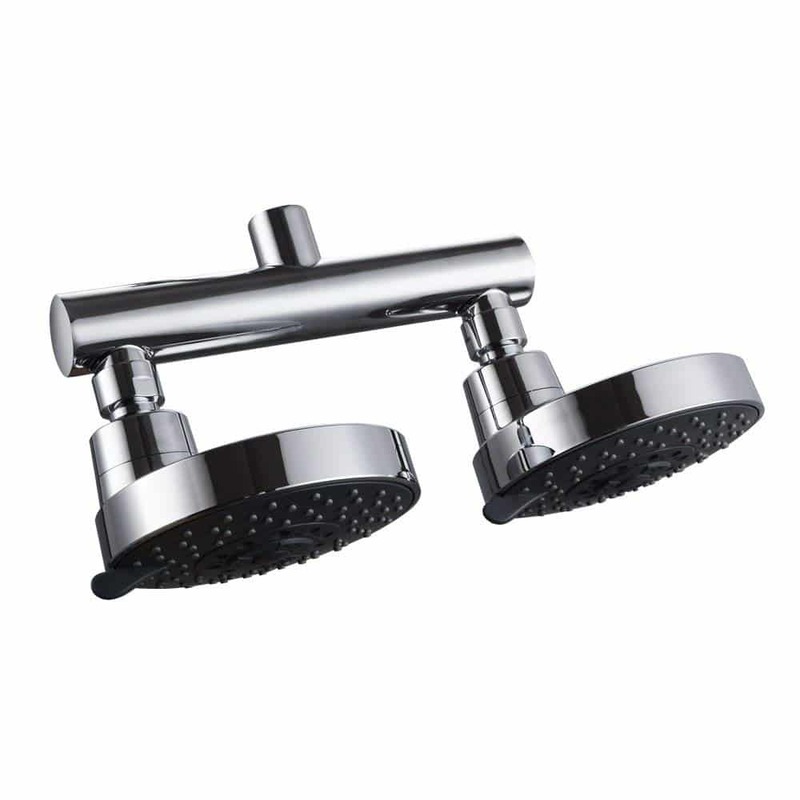 Each one swivels independently on ball-joints, and this could be used as either a shower for two or a independent twin stream shower which a solo individual can enjoy. As you have already noticed, the manifold acts as a shower head splitter… so you may experience a reduction in water pressure from having both heads running at the same time. However, if you remove the flow restrictor and manage to get the water pressure up in your water supply, you’ll have absolutely no problem (assuming of course this is a problem in the first place). While this may be a pricier unit compared to all other dual shower head reviews we’ve done… its because you get a complete package, a combo kit, a total set.